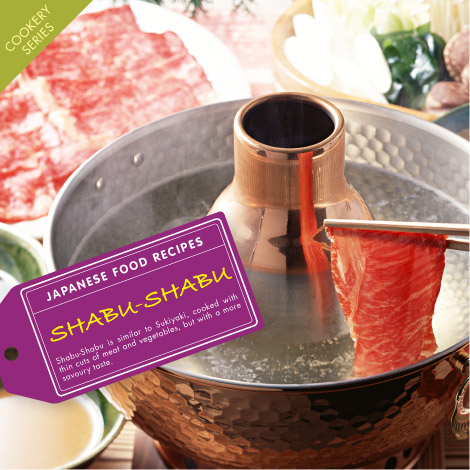 As well as having a great sounding name (say Shah-boo Shah-boo), Shabu-Shabu is a fun, sociable and tasty hot pot dish. It involves cooking thin pieces of meat and vegetables in stock broth and dipping them in tasty sauces. 1. In the centre of the dinner table fill the large pot with about 2/3 boiling water and add the dried kombu seaweed to soak for approx. 30 minutes. 2. Whilst the dried kombu seaweed is soaking, cut up all the meat and vegetables into small thin slices. Cut the tofu into small cubes. 3. Return the kombu seaweed to the boil using the small gas cooker and remove it just before the water starts boiling. 4. Get everyone who’s eating to sit around the dinner table! 5. Using chopsticks or a long fork, start swishing the meat, vegetables and tofu in the broth until cooked. The thinner the ingredients, the quicker they will cook. (Hint: You can leave vegetables at the bottom of the pot to cook until ready). 6. Use Ponzu (citrus soy sauce) or other sauces such as Sesame Sauce to dip the meat and vegetables and eat! 7. Once the meat and vegetables are finished, add the udon noodles to the pot for 2-3 minutes to soak up all the delicious flavours and finish the meal with them. I love shabu shabu but never knew it was this easy to make at home! Thank you! many thanks for the recipe; have just returned from two glorious weeks in Japan having sampled Shabu shabu in a hotel; superb experience which we have tried to recreate in UK; one slight problem…nowhere can we get the meat cut to the necessary thinness/thickness;any suggestions? Specially cut meat for Shabu-Shabu can be bought from Japan Centre on 14-16 Regent Street, London. If you do not live in the London area, the best thing to do is buy a block of Sirloin steak. Then freeze it first so it is easier to cut into thin strips. Then leave it to defrost before cooking. Does anyone know where I can buy shabu pot in London?